1/4" to 1/2" Wooden Doweling measuring about 18" long. 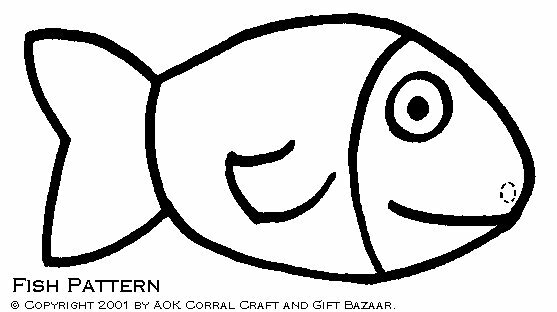 Using the fish pattern provided, copy the fish onto a piece of white posterboard with a pencil. Do as many fish as you want. Draw over the pencil lines with a black marker. 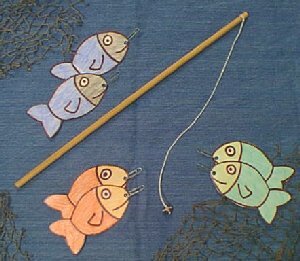 Trace the outline of the fish with a pencil. Apply Clear Contact paper to both sides of the posterboard. You should now have fish that look identical on both sides. Using a hole punch, make one hole at the mouth of each fish as shown on the pattern. Take the 18" piece of doweling. Cut a piece of string approx. 28" long. Secure the knot and trim off the string tail end. If you have a drill with a very small bit, the easiest way to attach the magnet is to drill a hole through the magnet and then thread the string through the hole and securely tie off. If you do not have access to a drill you will need to tie and glue the string on. Make sure that it is tied off with a secure knot. Trim off end of the string. Add a drop of hot glue from your glue gun onto both sides of the magnet where the string crosses over itself. Let the glue cool and set. Great to do with the kids or Make it for the kids. Fun group activity for at School or Sunday School. Easy and inexpensive gift idea!